We’ve been busy – as always – in the NativeAdBuzz office, and once again (weeks are going by fast, huh!?) it’s time for our weekly Top 5. In today’s email, we’re going to look at some down-right weird… wacky… and crazy Native Ads we’ve seen inside the NativeAdBuzz panel. If you’re not already a NativeAdBuzz member, you can take advantage of an exclusive $7 trial by clicking here. Bet You’ve Never Seen A Delta Winged Jet Do This Before – Unbelievable! Well, here in the NativeAdBuzz office we’re not entirely sure… but we like this ad, just because the intrigue factor does genuinely make you want to click-through, and find out what exactly this Delta Winged Jet is apparently doing! If Michael Jackson’s ‘Neverland’ doesn’t claim the #1 spot on this list… something’s wrong. Now, note that this ad has seen steady traffic for almost a year, and while there are gaps in performance, generally it’s a very strong example of an effective Native Ad. Just a straight-up curiosity piece, that naturally gets you wanting to click through! What Lies Have Been Written About You Online? Because the image – WOW. Well… we’re not sure that’s the most suitable image for the headlines context, but it’s so eye-grabbing, it achieves the ‘instant-attention-factor’ many online ads lack. And if you can do this with more of your ads… you’ll see MUCH higher CTR’s (and more money! To find loads more examples like this, claim your $7 NativeAdBuzz trial by clicking here! So here’s an unusual ad. You see, the headline copy is written as though it’s talking to you – giving you an order. It captivates you… puts you on the spot… and makes you feel ‘forced’ to read on. But when you DO manage to ‘nail’ this angle, you can see big changes with your campaigns CTR. If you do decide to take this approach, try to resonate with your market. Put them on the spot. Give them an ultimatum. Warn them about what happens if they DON’T do as you ask. It’s not easy, but do it RIGHT, and the rewards speak for themselves. You’re going to die a long, painful, tormenting death. Because of one stupid image. And it just goes to show, weird marketing can something be good marketing! 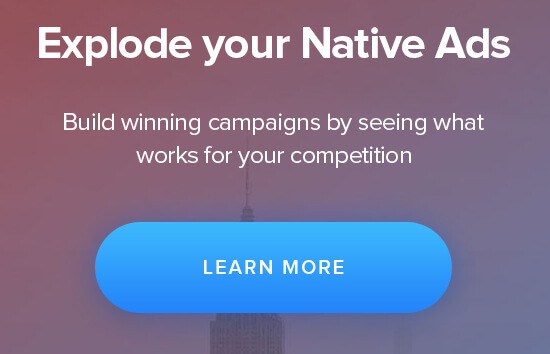 But if you want even more – and want to start looking at how your competitors are advertising – you’ll want to take advantage of your exclusive $7 NativeAdBuzz trial offer. Just Click Here To Claim! Let us know your thoughts on this week’s top 5, and as always, make sure you keep an eye on what’s working in your market, and what’s not!